A cyclist in Newton said she found a collection of thumbtacks in a bike lane this week and has warned other cyclists to be alert. Carrie Mosher was sneaking in a quick bike ride before her shift at her job in Newton on Tuesday morning when she spotted something glistening in the bike lane along Winchester Street. At first, she didn’t know what it was. But when her tire also started to sparkle in the sun, she knew whatever was in the road wasn’t good. 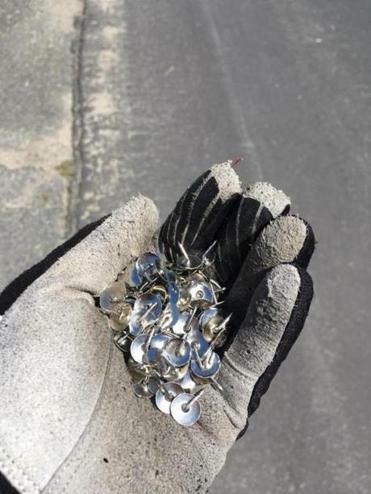 Mosher said she spent the next 10 minutes picking up a large collection of silver tacks, which were conspicuously laying faceup in the bike lane, “nicely spread out over a really long stretch” of roadway. Luckily for Mosher, she had a tubeless bike tire, so she didn’t get a flat, she said. But she’s using her experience to warn other cyclists, as the weather improves and more people decide to hit the streets on two wheels, to be vigilant in their travels, in case the thumbtacks were strewn in the road with malicious intent. In a Facebook post Tuesday, Mosher shared a picture of the area where she found the tacks, the small objects dotting the street. A second photo showed her holding a pile of the tacks in her palm. Alicia Bowman, president of Bike Newton, a nonprofit focused on making biking safer for people in the city, was alarmed by the social media post. She said her gut tells her they weren’t dropped in the bike lane by mistake. According to Bowman, parts of Winchester Street were recently re-striped to better accommodate cyclists. She wondered — living in a city where public hearings about biking can become contentious — whether the placement of the tacks was in response to the upgrades. Bowman is planning to bike out to the area and do a sweep of Winchester Street to see whether there are other spots with tacks in the road. Bike Newton also plans to send a note to its members, asking them to keep their eyes open and report anything suspicious to the authorities. This isn’t the first time tacks have been found in the bike lane on Winchester Street. Henry Finch, a Newton resident and avid cyclist, said around two months ago he was alerted by cyclists who reported getting flat tires while riding along the road. Finch went to the scene and spent 30 minutes picking up “hundreds” of tacks, which he found mostly in one spot, he said. No report has been filed with the Newton Police Department about Mosher’s recent incident, but officers are aware of the post circulating on social media, a spokesman said. Similar incidents have been documented across the country over the past few years. Last year, there were four separate reports of roofing nails found in the bike lanes of north Portland, Ore., according to BikePortland.org. Employees at a bike shop in Seattle became suspicious in 2016 when dozens of cyclists reported getting flats from “small black tacks” found along a newly opened cycle track. Mosher advised fellow cyclists to stay alert, wherever they are.